Entrepreneur Forrest Li took playing video games so seriously that he has managed to turn his hobby into a thriving business. Seed funding from China-based angel investors allowed Mr Li to start gaming firm Garena Online three years ago. The company's Garena Plus platform allows users to play multi-player games and chat and share tips and tricks. It attracts between 50,000 and 100,000 gamers every night to play any of eight games on offer, including League of Nations, Defence of the Ancients and Black Shot. The site's record usage came on a day last December when 1.4 million gamers were signed in at the same time. China-born Mr Li, who is now a Singapore permanent resident, told The Straits Times: "There is a large untapped video gaming market. The video gaming market in South-east Asia is worth about US$500 million (S$630 million) while Taiwan itself is a US$500 million market. "Our forecast in 2015, is that the South-east Asia market including Taiwan will be US$2 billion. The fastest growth will be from Indonesia, Thailand and Vietnam in the next three years." Mr Li said he decided to expand to Taiwan because of its large gaming population. 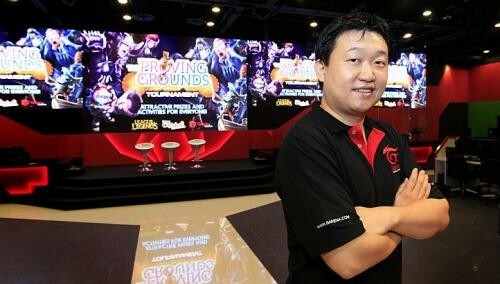 But his latest creation is right here - Garena Stadium in Bugis+, where he wants to promote video gaming as an e-sport. Opened last year, the 550 sq m space allows 90 gamers to play on the latest and fastest high-end PCs. Game play is projected on five big high-resolution screens so 200 spectators can watch. "This took one year of planning. It's a new concept to promote video gaming, to hold tournaments and generally to promote the sport. I haven't seen this set-up anywhere in the world," he said. Another area to explore is the training of video game commentators, the experts who give blow by blow accounts of the action. "South-east Asia is behind in this trend. It is already happening in the United States and South Korea. Last year, there was the grand final of League of Legends played in Los Angeles," noted Mr Li. "The top prize was worth more than US$5 million, it was broadcast on TV and more than eight million people watched it live. I want to start this trend here." Garena is supporting 40 professional players in Singapore, Malaysia, Taiwan, Vietnam, the Philippines and Thailand to play League of Legend tournaments in the region and further afield. All are salaried and train 10 to 12 hours daily. Each national team is run as a club with a professional coach. Some teams train in the gym for stamina and have a PR firm to manage their image. Garena company has been profitable since the end of 2011 but Mr Li declined to give figures. According to management consultancy Deloitte, Garena's profits have grown 2,000 per cent over three years. It ranked the firm at 15th on its Technology 500 listing for Asia Pacific last year. Gamers are not charged any fees for using Garena Plus. The company earns revenue from the sales of digital accessories such as extra weapons and armour and premiums sold at its store in Bugis+. The firm has 600 employees, with 100 here.